3 years ago. Jay Schweitzer and Doug Parsons teamed up to create a brand new motocross contest called Ride to the Hills. In 2004 Schweitzer found the ultimate freeride spot which he dubbed Jackpot Ranch after Jack Krauss who owns the property. We spent several months scouting, sculpting and organizing our first contest. With the help of Jesse Olson, Dane Herron and Red Bull we had created the ultimate course which consisted of 150 ft. hill jumps. 130ft. off camber hip jumps, step downs leading into 150 foot step ups it was the most insane freeride event in history. The first event featured top riders: Nate Adams, Drake McElroy, Dustin Miller, Ronnie Renner, Matt Buyten, Mad Mike Jones, Doug Parsons. 1st place went to Parsons, 2nd place was Dustin Miller and 3rd place was Nate Adams. This event is based upon style not just tricks. This is the first rider contest that the winner is scored and determined by all the competitors. After the event was finished Jay Schweitzer produced a 1/2 hour show for Fuel Channel which is still being run today. In 2005 Jay and Doug were approached by Red Bull to make this event and official Red Bull contest. It is now called the Red Bull Ride to the Hills. In 2005 the event was held again at Jackpot Ranch but this time we brought in helicopters, quadcams for ground tracking shots and the most elite film crew known to man. In addition we added a bunch of new jumps which has now made Jackpot Ranch one of the top 3 freeride spots in the world. 1st place went to Dustin Miller for his crazy combos off all the jumps. 2nd place went to Mike Mason for sheer style and grace, 3rd place was Ronnie Renner for his huge extentions off everything. 2006 the Red Bull Ride to the Hills hits the road with a 7 day journey into freeride paradise. The contest will start in Ocotillo Wells and end in Glamis, California. The riders will include: Jeremy “Showtime” McGrath, Ronnie Renner, Dustin Miller, Nate Adams, Travis Pastrana, Mike Mason, Robiie Madison, Todd Potter, Brian Foster, and Drake McElroy. In the Powerband Films usual style we will have helicopters in the dunes tracking the riders off off huge jumps. This event will set the standard for all freeride contests to come. 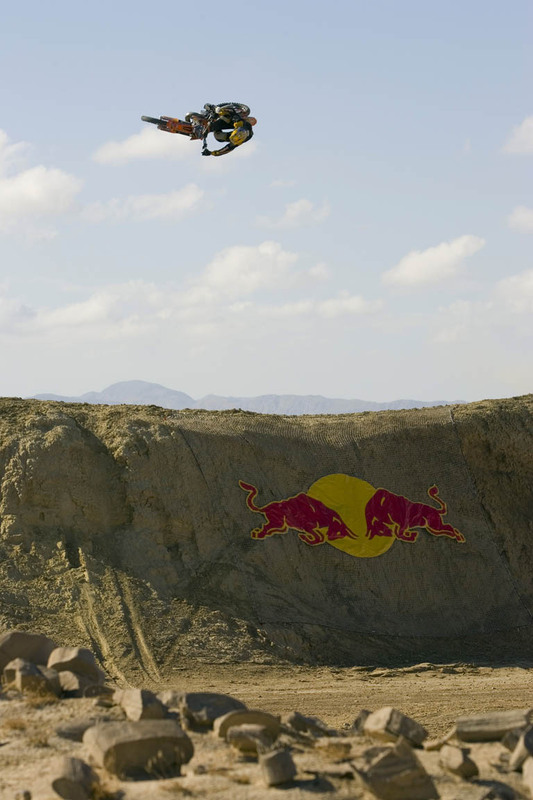 Stay tuned for more updates on the winer of the 2006 Red Bull Ride to the Hills contest.